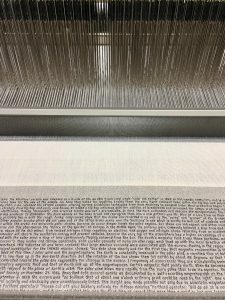 Fringes of Beauty is a new exhibition of Textiel Museum in a town of Tilburg, the Netherlands. 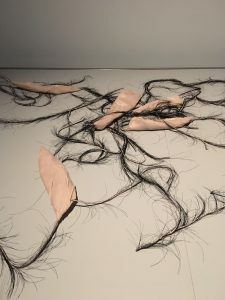 The museum commissioned a number of artists to develop artworks that balance between good and bad taste, attraction and repulsion, fascination and discomfort. teraction is really fascinating to watch: the skins start jumping and moving and the louder the public is the more intensive the movement. 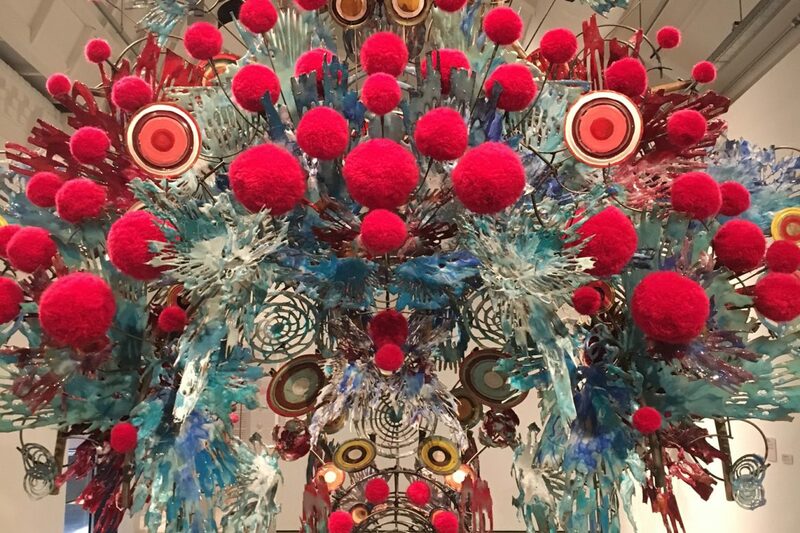 Heringa/Van Kalsbeek created a colourful sculpture decorated with laser-cut, resin-coated canvas, metal tins and red pompons. It is inspired by traditional headpieces of Chinese brides which are adorned with flowers and pompons. 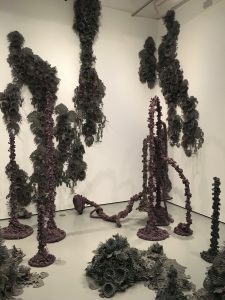 Tanja Smeets used felt and knitted textiles to create a structure that resembles mould and mushrooms attached to the wall. Other parts look like some giant plants finding their way up. 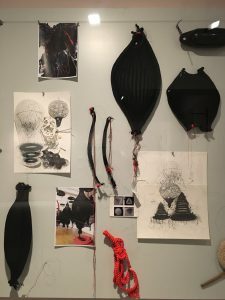 To make the structure Tania worked in the Museum’s textile lab with laser technology and knitting machines. 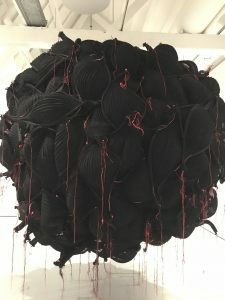 Karin van Dam’s sculptures look like meteors or black medusas wanting to swallow everything around. Created with black, shell-like forms made out of monofilament and orange PVC cords hanging down. They create a heavy, apocalyptic feeling of insecurity. 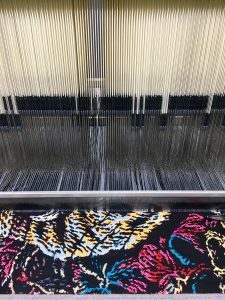 All artists used the Museum’s TextielLab which is equipped with state-of-art weaving and knitting machines. 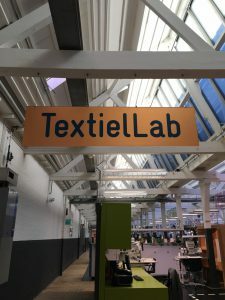 You can visit it and watch different processes, such as jacquard weaving of some complex textile patterns (my favourite is a fabric with a woven text of Wikipedia.